Raise “Workhorse” Oysters to Help Delaware’s Inland Bays! 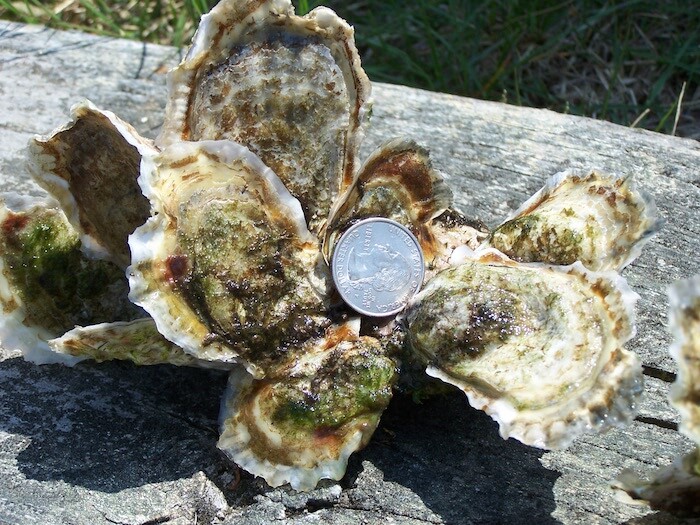 Rehoboth Beach, DE – The Delaware Center for the Inland Bays wants YOU for its Oyster Gardening Program: a restoration effort that brings scientists and volunteers together to restore the American oyster (Crassostrea virginica) to the waters of Delaware’s Inland Bays. This program recruits residents of local waterfront properties to raise small amounts of oysters in the waters surrounding their docks and bulkheads. It began in 2003 and is currently a partnership between the Center, Delaware Cultured Seafood and the Town of South Bethany. Because they are filter-feeders, oysters have the unique power to improve water quality as they “eat”, removing tiny one-celled plants (called phytoplankton) and other small particles from the water. One adult oyster can filter up to 50 gallons of water each day! Often considered the building blocks of robust communities of organisms in Bays and oceans, they solidly attach to each other. This creates reefs that serve as shelter and spawning areas for organisms like barnacles, mussels, worms, algae, plankton, fishes and crabs! The Oyster Gardening process begins with the disease-resistant oyster larvae. At a facility located along the upper Indian River, over one million of these microscopic larvae attach themselves to recycled oyster shells in a natural process known as remote setting. After several weeks, the pinhead-sized oysters are removed from the nursery tank and distributed to the Gardeners who will care for them for a period of one year. The Center then collects the 1-year old oysters and uses them in various restoration or research projects throughout the Inland Bays. To be an Oyster Gardener, one must be able to lift approximately 25 pounds, have waterfront property, and possess basic computer skills. Gardeners are required to periodically clean the oysters and record all time spent using a simple online log. There will be a training event on June 15, 2018 in Rehoboth Beach which all new Gardeners should plan on attending. Oysters and gear will be available to new Gardeners in late June or early July. A $50 program donation is requested in order to help cover the cost for oyster sets, spat, training, and program maintenance. To apply to be an Oyster Gardener, please fill out a short application at www.inlandbays.org/oystergardener. To volunteer or for more information, please contact Bob Collins, Delaware Center for the Inland Bays, at 302-226-8105 ext. 111 or by email at jamesfarm@inlandbays.org.